One of the easiest ways to save money on your heating and cooling bills is to install a smart thermostat in your Brooklyn home. Although it’s easy to take the thermostats for granted, they’re a key component of your heating and cooling systems. Save money. A programmable thermostat allows you to schedule heating and cooling. You can set the heat to kick in just before you wake up in the morning or just before you arrive home from work. 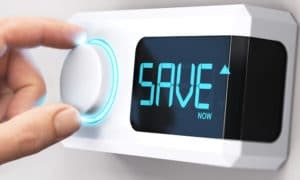 By raising or lowering the thermostat by 7-10 degrees for eight hours a day while you’re at work, you can save loads of money. A smart thermostat allows you to program different temperatures for different rooms in your home, allowing you to cater to the individual preferences of family members. Remote control. Many smart digital thermostats can be controlled and adjusted via a smartphone if you are away from home. If the heat is programmed to come on just prior to when you typically arrive home from work, you can adjust it remotely if you’re coming home early. Track data. Some modern thermostats can track energy usage and operating costs for your HVAC system. This provides an indicator of how efficient your HVAC system is and allows you to adjust the programming to reduce operating costs. Self-learning. Newer programmable thermostats can learn your preferred heating patterns and adjust temperatures accordingly. Contact Petri today to bring your Brooklyn home heating system into the digital age. If you want to purchase a new smart thermostat for your home or if your heating system is experiencing bigger problems, you can call us at (718) 748-1254. We’re always glad to help!